Author of Captain Benjamin Page, A Forgotten Rhode Island Hero of the American Revolution, Rediscovered in Sycamore, Illinois. 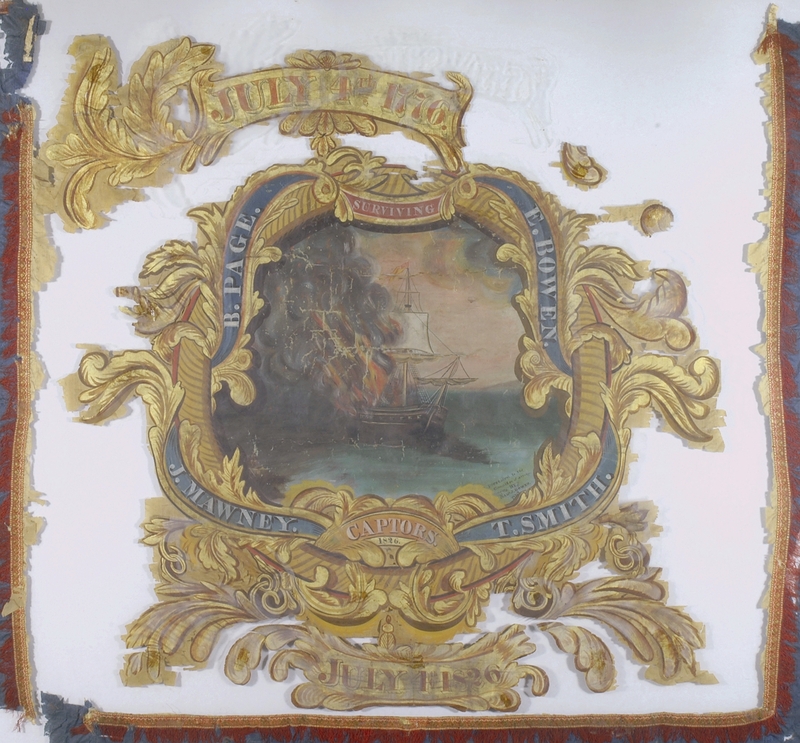 Special contribution by the author to the Gaspee Virtual Archives. Benjamin Page, Sr., was born in 1753 and is believed to be a descendant of an early Rhode Island family that may have arrived with Roger Williams. His father, Ambrose Page, was born in Providence, 1723, was a sea captain during the Seven Years War, was a member of the Rhode Island General Assembly, and had married Alice Smith. Left: Portrait of Benjamin Page, artist and date unknown, but probably c1826. From the collection of Page family descendants, Frank and Trudy Drew. Benjamin Page was just 19 years old at the time of the Gaspee Affair. His mother died nine days before this birthday. The Page family were sea-goers with operation of a small farm on the side. They were related to and friends of the Providence families of Hopkins, Jenckes, Angells, Sabins, Whipples, Bowens, Smiths, Browns and Burroughs, but history has given them little prominence. He became a very close friend and admirer of Commodore Abraham Whipple and served with him several times during the American Revolution. Right: 1826 parade banner depicting the burning of the Gaspee. Surrounding the picture are the names of the four then 'surviving captors' who participated in the raid who were being celebrated: B. Page (upper left), E. Bowen, T. Smith, and J. Mawney. Courtesy of RI Historical Society RHiX17317. Click image to enlarge. He had met with his young friends at the Sabin's house that historical night: "Doc" Mawney, "Turp" Smith, "Eph" Bowen and Joe Bucklin. This same group marched in a Fourth of July parade years later. All, of course, could have been exposed and identified by the British after the Gaspee Incident. 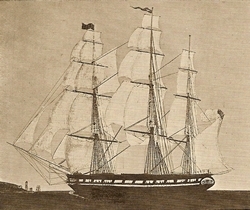 Page had a been a member of the Rhode Island Militia and was appointed captain of the first of the two row galleys which were later rigged as schooners. While John Paul Jones was ranked No. 18 of the first commissioned captains of the Continental Navy & Marine Corps, Page was ranked No. 18 among the first lieutenants. Perhaps that was the only association Page could have had with John Paul. He apparently never sailed under him and was not with Whipple when he sailed with Jones. Thus, Page, as did many others, stayed behind to defend the American continent, while Jones was away three years defending the European side of the Atlantic. (According to Illinois through two hundred and forty-five years, 1673-1918 pub by Chicago Hist Soc. one object donated to the exhibition by Capt. Benjamin Page was a marine spyglass used by John Paul Jones.--ed). Beside Captain Whipple, Page also sailed under Capt. Samuel Nicholson, Capt. John B. Hopkins, Jr., Capt. Dudley Saltonstall, Capt. Joseph Olney, Capt. John Manley and Capt. Hoystead Hacker. Page was several times a Third Lieutenant, a Second Lieutenant and finally became Captain of the Regulator in 1782 before the war ended. He had served on eight different ships, and at least twice with Whipple on the Providence. One historian placed Whipple as the most outstanding commodore of the then Continental Navy. Page was a prisoner of war three times: at Penobscot, MA/ME, with Paul Revere; at Charleston, SC, with Whipple; and quite likely at the Battle of Rhode Island. Page had served eleven years from the Gaspee Affair to the end of the Revolution in 1783. After the war, Page returned to Providence, but to continue farming he moved in 1824 to Massillon, Ohio. He was first married to Ann Sweeting and they had a son, Ambrose, who became a sea captain but apparently did not move with the rest of the family to Ohio. Benjamin then married Sarah R. Wamer and they had seven children: William W., Elizabeth W., John B., Oliver R., George W., Benjamin, Jr., and Henry Edward. William moved to South America and became a captain in the Argentinian Navy. John, Oliver and George all died in Ohio. Oliver married Margaret Caroline Troup and they had children. William married Micaela Paven and Henry married Elizabeth Pfaff. Captain Benjamin Page, Sr., died at age 80 in 1833 and was first buried near Massillon, it is believed, and later moved to the Westlawn Cemetery at Canton, Ohio. His son, Ambrose, is buried at the Old North Burial Ground at Providence, along with other members of the Page ancestry. Benjamin, Jr., and Henry retired and moved to Sycamore, Illinois, in 1853. They were later joined by Elizabeth who had married Senator David Austin Starkweather of Ohio. The family were among the first members of the Episcopal church in Massillon and also in Sycamore. Benjamin, Jr., was also a captain and was the last to die. He had had a monument erected in the Sycamore cemetery to all members of his father's family. From an inscription on this monument, "of the Amer. Rev." it was learned about Capt. Benjamin, Sr.'s, participation in the Continental Navy. Benjamin, Jr., his wife Mary D. Johnson, Henry and Mrs. Starkweather are all buried there. Because Benjamin, Jr., and Henry had no children, it was thought the Page family ended then westward progression in Sycamore. However, it was learned in 2000 that a descendant of Mrs. Starkweather's was living in Oregon. Sycamore is located in DeKalb County, another Revolutionary War name, and because it has little other relationship to the American Revolution, it is honored to have this association with the Gaspee Affair, with Gaspee Days, and Warwick, RI. So as to avoid confusion, note that there were othermen named Benjamin Page, such as one b26 May 1753 in Groton, MA. We'll also note that genealogical sources can be wildly off on dates and names. Just why was Benjamin Page involved in the Gaspee raid? There are several explanations that come to mind. His father was involved in merchant shipping, and Ambrose was undoubtedly a compatriot of John Brown and like men interested in relief from the Gaspee's limitations on their smuggling operations of molasses, rum, and other goods. It is quite possible, although purely conjectural, that Ambrose Page himself was also along for the raid on the Gaspee. The 1770 List of Providence Taxpayers shows Ambrose Page's two adjoining properties located on the East Side neighborhood of Providence on the west side of North Main Street. His are the only Page properties listed on the map. So, we know that young Benjamin Page was living in the area when the men met to plot the attack on the Gaspee on June 9th, 1772. His family likely had a vested interest in getting rid of the British ship. What is also compelling is that he and many of his friends of a similar age were compatriots in the attack on the Gaspee, and many of many were related by blood. Finally, Benjamin Page's later long service in the Revolution gives testimony to his anti-loyalist leanings. Writing in An Empire on the Edge (2014), author Nick Bunker indicates that in October 1774 it was Captain Benjamin Page that sailed the ship, Smack, to the coast of Holland where he was intent on buying cannon, gunpowder, and other weaponry with which to arm the American colonies. This would clearly be an act of high treason, and British spies passed on this intelligence to the ministers of King George III, who became immediately alarmed at the prospect of the Americans arming themselves as if to prepare for war against the British. Left: The Ann & Hope, commanded by Captain Benjamin Page, on its first trip to China . From an old painting commissioned by Brown & Ives. The following snippets are from the Early American Newspapers Collection obtained through the NEHGS portal, mostly the Providence Gazette. In July 1784 Capt. Benjamin Page arrived from Amsterdam, and in 1785 commanded the brig Providence to Jamaica. In 1787 he arrived in Providence from Martinico in the brig Hope, and in 1791 he arrived from India in the Hope. From March 1792 to October 1793 he sailed the Hope to and from Canton, China, and in 1795 he commanded the Halcyon to Canton. In July 1798 he took command of "the new and elegant coppered ship" Ann and Hope for Canton, with a crew of sixty, and armed with twelve 9 pounders, and returning in June 1799. Note that both the Hope and the Ann & Hope were owned by Gaspee raid leader John Brown's mercantile and shipping firm of Brown & Ives. It is obvious that John Brown considered him one of his most trustworthy and capable captains, and it is, therefore, also quite possible that Benjamin Page was along on some of John Brown's earlier slaving expeditions that defined the Triangular trade. It is to be pointed out that, as of this date, we have no evidence of this whatsoever. We find meantime, that one of your Gaspee raiders was Capt. Benjamin Page, who several times in the 1790s called to Sydney while he was sailing ships owned by John Brown (or, Brown and Ives) of Rhode Island. I should explain that our standard Australian shipping registers have only highly-abbreviated information on ship arrivals and departures, Brown and Ives ships are noticed, but in ultra-sketchy ways... .
From History of Providence County (New York: W.W. Preston & Co., 1891), p176: "Benjamin Page was a prominent shipmaster, and for many years commander of a ship in the East-India trade" The author also says that Page Street in Providence was probably named after Benjamin Page, whose estate was upon the corner of Potter and Broad streets, but this may have been just as likely his father, Ambrose Page. Benjamin Page was listed in 1790 census as living in North Providence, RI. In either event, Benjamin Page was married first to Ann Sweeting (born c1764 in Rhode Island) with whom he had two sons, Ambrose S. Page, (c1794-c1851) and William W. Page, (c1798-after 1852). Benjamin's first wife Ann Sweeting Page died 22Mar1799 and it can be surmised that perhaps she died as a result of giving birth to William W.
We see no further mention of Benjamin Page's maritime exploits and he probably retired from the sea after this last voyage to China in 1799 when he got married to his second wife, Sarah Reed Warner (25Mar1776 - 6Mar1849). This marriage may have been as much out of necessity as out of romance. Marriage at the time was an economic imperative, and Captain Page had two young sons to care for, so it was not unusual to be married again within a half-year of the previous spouse having died. As noted above, they went on to have many children, and in 1803 they purchased a stately farm house in Portsmouth, RI previously owned by British loyalist, Henry John Overing. This house had been used by the British General Prescott as quarters when the British occupied the island during the Revolutionary War. As widely reported in the local newspapers in 1828, the Pages were visited at this home by American war hero General William Barton, who had effected the commando raid that captured General Prescott during the preliminaries to the Battle of Rhode Island in 1777 (See further details). The house still exists adjoining the Prescott Farm Museum on the Middletown-Portsmouth, RI line. Right: The Overing House in Portsmouth RI, wherein British General Prescott was captured in 1777, later the residence of Captain Benjamin Page. From Lossing's Pictoral Field Guide to the Revolution, 1859. Benjamin's second wife Sarah (sometimes recorded as Sally) may have been from a well-heeled Newport family; the deed to the farm was purchased in Sara Warner Page' s name only, but perhaps this was to limit Benjamin Page's discoverable assets. We know from land records that Benjamin Page mortgaged his home shortly after its purchase, but the entirety was paid off within a year. Despite the worldly holdings expected of a retired sea captain, he claimed indebtedness, possibly to bolster his pension claim in 1818. As part of the supporting documents for his pension application, there appears to be a complete inventory of Benjamin Page's holdings as of March 1818 valued at a total of only $684. He also lists his dependents and their ages at that time as being: his wife 44, and his mother 81, (but this must've been his mother-in-law since his biologic mother died in 1772). Children were listed as: John B. Page 17 (therefore, born c1801), Oliver W. Page 14 (c1804), George N. Page 12 (c1806), Benjamin Page, Jr 10 (c1808), Henry H. Page 7 (c1811), and a servant (name indecipherable) of 8 years. He also listed Ambrose Page, 24 (c1794), at sea, and William W. Page, 20 (c1798). We do not know with certainty what sort of farming was carried on at the Page farm in Portsmouth. The previous owner was heavily involved in sugar refining, and it is possible that distillery-related operations were carried on there. Benjamin Page and the other three (then known) surviving Gaspee raiders were feted in the 1826 Providence Fourth of July celebrations, and we believe that he was long held in high esteem by the citizenry of Rhode Island. But despite their nice surroundings, Benjamin Page, his wife, and children packed up sometime after 1828 and moved Westward. Benjamin and Sarah Page later sold their home in 1830 to his eldest son, Ambrose S. Page. Just why they moved is subject to speculation, Benjamin Page was 71, but probably the necessity to follow their children was among the reasons. Economic pressures and opportunities were numerous in the early Westward expansion of the United States. The Land Law of 1785 made available 15% of Ohio lands to men that had been officers in the Revolution. We also might suspect that Page and many fellow Gaspee raiders may have been involved in some insider land speculation, fostered by Brown & Ives, along and distal to the Erie Canal. In either event, it is gladly surmised that Benjamin Page's health was still good enough to take up farming in Ohio. Benjamin Page died 13Nov1833 at the age of 80 in Jackson, near Massillon, OH and is now buried in the family plot in Canton, OH. In 1852, in Ohio, Benjamin Page, Jr. made claim for the pension payments that had been in arrears. He also gave a note indicating that the widow of Capt. Benjamin Page died 6March1849, and that his parents had been married in Providence, RI 19Sept1799. Further papers list the surviving children as: Ambrose S. Page, John B. Page, Elizabeth W. Page (by then married to David Starkweather), Oliver R. Page, Benjamin Page, Jr, Henry E. Page, and William W. Page. John B. Page died in 1839 with no heirs, Oliver R. Page also died in 1839 (leaving Mary, William, and Alfred), Ambrose Page died in 1851 with no children. William W. Page went to Argentina in 1824 and served as a Captain in the Argentinian Navy in the War against Brazil until 1832, he married a Micaela Pevon in 1827 and had one son that emigrated to Chile. Benjamin Page, Jr later died in 1887 in Sycamore, IL. Unfortunately, nothing in the pension paperwork relates to Benjamin Page's involvement with the burning of the Gaspee in 1772. We found through the Early American Newspapers Collection a marriage notice of 5July1835 at Detroit of David A. Starkweather, Esq., lawyer, to Mrs. Elizabeth W. Evans. Apparently, this was her second marriage. According to the Biographical Directory of the US Congress, David Starkweather (1802-1876) was an Ohio State Senator who went onto the US House of Representatives, and was later a US Envoy to Chile. The above Oliver Page (1806-1839) is variously listed as Oliver R. and Oliver W. Descendant Orel Lea from Australia indicates this was probably denoting his maternal grandfather's name of Oliver Ring Warner. Oliver R. W. Page's son William Graham Page (born in 1832 in Massillon, OH) later immigrated to the Australian gold fields of Victoria, where he died in 1885. Sadly, they have not been able to find any further living direct descendants that carry the Page surname. We are also proud of his later achievements as one of the first Mariners to sail from America to Australia’s new Colony. In 1792-97 he captained clipper ships to Canton via Sydney, Australia. My Grandmother, Nellie Page (1897-1973) was the grand-daughter of William Graham Page, who immigrated to Australia in the early 1850’s. William (1832-1885) was the son of Oliver R. W. Page, and the grandson of Benjamin Page. Benjamin Jnr b. 1783, was the son of Esther Seaver, Benjamin’s 1st wife, and he was the lawyer who died in 1808 of a fever, in Georgia. Ambrose Jnr. B.1794, (of the Overing House) was the son of the second marriage in 1791 to, Ann (Nancy) Sweeting. Sadly she became ill while her husband and stepson were on the Ann and Hope, and died in March, before their return in mid 1799. Benjamin was quick to remarry the daughter of an associate, Oliver Ring Warner. His third marriage to Sarah (Sally) Read Warner produced another 6 sons, and a daughter. The 1st Benjamin Page Jnr was replaced with another, born at the Overing House in 1810. It is my suspicion that Sarah was a (grand)niece of Benjamin Franklin’s wife, Deborah Read. The Gaspee Days Committee recognizes Captain Benjamin Page as a true American hero for his role in the attack on the HMS Gaspee in June of 1772. Lossing, Benson J. Pictoral Field Guide to the Revolution. Volume I, Harper Brothers, New York, 1859. Williams, Catherine, Biography of Revolutionary Heroes: Containing the Life of Brigadier Gen. William Barton and also of Captain Stephen Olney. Providence, Published by the author, 1839.